The information contained in traditional print materials such as important records, minutes of important meetings, original drawings, and other similar documents cannot be preserved for a very long time due to several reasons. As the time pass by, the information contained in these materials fades out, the medium becomes brittle and finally the document becomes unusable. These documents can be lost forever unless there are alternative arrangements for recapturing and reproducing them. Fortunately, technological advances have provided suitable alternatives for the preservation of such valuable documents. Digitization process is of crucial importance for data processing, storage and transmission, because it “allows information of all kinds in all formats to be carried with the same efficiency and also intermingled”. Unlike analog data, which typically suffers some loss of quality each time it is copied or transmitted, digital data can, in theory, be propagated indefinitely with absolutely no degradation. This is why it is a favoured way of preserving information in an organization in the present day environment. Digitization process in an organization deals with strategies, methods and tools used to capture, manage, store, preserve, and deliver content and documents related to organizational processes. It deals with tools and strategies which streamlines the unstructured information of the organization. Digitization is the process of converting information into a digital format. In this format, information is organized into discrete units of data (called bits) that can be separately addressed (usually in multiple-bit groups called bytes). This is the binary data that computers and many devices with computing capacity can process. Text and images can also be digitized. Similarly digitization of audio and video presentations is also possible. Digitization process is also known as imaging or scanning and is the means of converting hard-copy, or non-digital, records into digital format. Hard-copy or non-digital records include audio, visual, image or text. Digitization may also be undertaken by taking digital photographs of the source records, where appropriate. Digitizing information makes it easier to preserve, access, and share. For example, an original document in hard copy is available for its access only at the physical location of its storage, but if the document is digitized, it can be made available simultaneously to many employees in the organization. Hence, there is a growing trend towards digitization of important and significant documents in a modern organization. Digitization process helps in the reduction in physical space requirements and a much quicker document search and retrieval system. These are just two of the many benefits of digitization of the paperwork in the organization. Digitization process integrates digital technologies into the organizational strategy and operations. It helps the organization to focus on opportunities to merge the best of both digital and physical processes. The process aims to profoundly extend competitive advantages and accelerate profitable growth. Management begins by determining whether they are to prepare for ‘digital disruption’ or ‘the digitization process.’ Digital disruption ultimately destroys and replaces physical operations with purely digital solutions. Management’s primary task, therefore, is to change the mix of operations to compete effectively in a purely digital world. Digitization process, on the other hand, merges the best of digital and physical worlds into digital innovations that create wholly new sources of value. Digitization process requires that management changes not only the mix of the operations but also the capabilities of the employees in and around those operations. The following actions of the management help to maximize the chances for the digitization process to succeed. To mobilize the organization to win and to transform the approach to innovation. To develop appropriate operating practices and to build a leadership team digital with know-how. In the present day environment, customers want on line all the information from their supplier. They want their suppliers to provide them automated access to all the data which were earlier provided in hard copies. The traditional organization is not able to meet these expectations. The traditional organization is required to adopt in a massive way the digitization process to meet the ever increasing demands of the customers in this regards. The organization is required to go in for a radical overhaul of the business processes. Intuitive interfaces, around-the-clock availability, real-time fulfillment, personalized treatment, global consistency, and zero errors etc. are the facilities to which the customers have become increasingly accustomed to in the present day environment. To meet these high customer expectations, the traditional organization is required to accelerate the digitization of its business processes. It needs to go beyond simply automating an existing process. It has to reinvent its entire processes, including cutting the number of steps required, reducing the number of documents, developing automated decision making, and dealing with regulatory and fraud issues. Operating models, skills, organizational structures, and roles need to be redesigned to match the reinvented processes. Data models are required to be adjusted and rebuilt to enable better decision making and performance tracking. Digitization process frequently requires that old wisdom is combined with new skills, for example, training of a marketing manager to program a pricing algorithm. New roles, such as data scientist and user-experience designer, may be needed. The benefits are huge. By digitizing information-intensive processes, costs can be cut. In addition, replacing paper and manual processes with software allows the organization to automatically collect data which can be mined to better understand process performance, cost drivers, and causes of risk. Real-time reports and dashboards on digital-process performance permit management to address problems before they become critical. Instead, the organization reinvents the processes, challenges everything related to an existing process and rebuilds it using cutting-edge digital technology. With the dramatic increase in types of data and respective formats, the need to integrate and share data across systems has become vital. For the organization which is adopting the digitization process, this involves delicate balancing of the processes that move data between systems. The benefits of the digitization process are available in the following effective and efficient ways. Streamlining of the processes – It results into (i) delivery of the information / data to the right person at the right time, (ii) rationalization of the paper based processes, (iii) optimization of the processing time and (iv) improvement in productivity and efficiency. Management of documents – Management of documents becomes better organized by (i) storage and control of the documents in a structured and secure manner, (ii) protection of the records earlier kept in paper form, and (iii) reduction in the risk of lost / misplaced documents. Data capture – By data capture the organization (i) capture information from paper documents, multimedia and digital sources, (ii) read Information from scannable inputs like barcodes, QR (quick response) codes, RFID (radio frequency identification) chips etc., and (iii) transform and deliver captured information into various systems such as document management, CRM (customer relationship management), ERP (enterprise resource planning), and MIS (management information system) etc. Continuous availability – Through digitization process, the organization is able to ensure continuous availability of the information since the end users are constantly connected and are provided with robust high availability and disaster recovery solutions which are either LAN (local area network) enabled or WAN (wide area network) enabled. Minimization of paper storage – Since paper based documents and their copies for distribution gets eliminated by the digitization process, the costs associated with the preparation and storage of paper based documents get eliminated. The conversion of documents in digital form not only minimizes space for storage but also greatly improves access of the documents. Elimination of manual search – Searching for documents is time consuming especially when files are not kept systematically or they get misplaced. Electronic document management can provide an immediate response to a query, bypassing the long process of a paper search. Eliminating the manual search enhances employees’ efficiencies and result into faster response times. Improved availability of information – Digitization process results into multipoint access of the information. Employees working in different departments, areas, or locations can all have access to the same information through their computers. Images are decentralized, and therefore more easily and readily accessible. Further digitization process provides the ability to open and view several files at the same time. Also several employees can simultaneously work on the same document. The access to the document is also faster thus reducing time spent searching. Increased information security – The security of information is increased since access of the information to the employees can be controlled right down to an individual page, giving the employees access only to the information which is directly relevant to them. Also electronic document management can provide another form of security through ‘disaster recovery’. Once the data is converted to digital format, a backup copy is stored in a disaster recovery vault. The backup is used to recover lost information in case of an unfortunate disaster. Reduce storage costs – The cost of filling and maintaining filing cabinets is staggering. There are costs associated with equipment, space, and the salaries it takes to maintain the filing cabinets. A four-drawer filing cabinet can hold only around 20,000 pieces of paper. With digitization process, the requirement of physical storage gets greatly reduced since only those paper documents need to be retained for long periods of time which are needed for legal requirements. All other documents can be stored in an external hard disc or a compact disc. Enhance customer satisfaction – Digitization process provides the employees with the ability to locate and retrieve documents instantaneously. This in turn facilitates immediate response to customer questions and inquiries with limited downtime and hence aids in enhancing customer satisfaction. Key concepts used in the digitizing process are described below. Digitization – It is also known as imaging or scanning. It is the means of converting hard-copy, or non-digital, records into digital format. Hard-copy or non-digital records include audio, visual, image or text. Digitization may also be undertaken by taking digital photographs of the source records, where appropriate. Digital preservation – It is a process by which digital data is preserved in digital form in order to ensure the usability, durability and intellectual integrity of the information contained therein. A more precise definition is ‘the storage, maintenance, and accessibility of a digital object over the long term, usually as a consequence of applying one or more digital preservation strategies’. These strategies may include technology preservation, technology emulation or data migration. Criteria to be considered for digital preservation are (i) quality (usability, functionality), (ii) persistence (long-term access), (iii) interoperability (e.g., across platforms and software environments), (iv) storage space (file size), (v) storage hardware, and (vi) storage media (e.g., hard discs, DVDs, CDs). Digital repository or archive – The digital repository is where digital content, assets are stored and can be searched and retrieved for later use. The repository supports mechanisms to import, export, identify, store and retrieve digital assets. Putting of digital content into a repository enables the employees and the organization to manage and preserve it, and therefore derive maximum value from it. Master- It is a faithful digital reproduction of a document, optimized for longevity and for production of a range of delivery versions (derivatives). Masters are captured at the highest practicable quality or resolution and stored for long-term usage. Typically, masters are stored in an off-line mode on hard disc or CD and are accessed only for the production of derivative images. Derivative – It is an image created from the master image, through some kind of image editing process to create a user or working copy. The process usually involves a loss of information to reduce the size by sampling it to a lower resolution, using lossy compression techniques, or altering an image using image processing techniques. Typically, derivatives are made for purposes such as web access, including ‘thumbnail’ images, or as ‘reference’ or ‘service’ images that can fit completely within an average monitor. Digital images – They are the electronic snapshots taken of a scene or scanned from documents, such as photographs, manuscripts, printed texts, and artwork. The digital image is sampled and mapped as a grid of dots or picture elements (pixels). Each pixel is assigned a tonal value (black, white, shades of gray or colour), which is represented in binary code (zeros and ones). Resolution – It is a measure of the ability to capture detail in the original work. The spatial frequency at which a digital image is sampled (the sampling frequency) is often a good indicator of resolution. Dots-per-inch (dpi) or pixels-per-inch (ppi) are common and synonymous terms used to express resolution for digital images. Pixel dimensions – These are the horizontal and vertical measurements of an image expressed in pixels. This can be determined by multiplying both the width and the height by the dpi. As an example, an 8 inch x 10 inch document scanned at 300 dpi has the pixel dimensions of 2,400 pixels (8 inch x 300 dpi) by 3,000 pixels (10 inch x 300 dpi). Bit depth – it is determined by the number of bits used to define each pixel. The greater the bit depth, the greater is the number of tones (grayscale or colour) that can be represented. Digital images can be produced in black and white (bi-tonal), grayscale, or colour. Bit depth – A bi-tonal image is represented by pixels consisting of 1 bit each, which can represent two tones (typically black and white), using the values 0 for black and 1 for white or vice versa. A gray scale image is composed of pixels represented by multiple bits of information, typically ranging from 2 to 8 bits or more. A colour image is typically represented by a bit depth ranging from 8 to 24 or higher. With a 24-bit image, the bits are often divided into three groupings namely (i) 8 for red, (ii) 8 for green, and (iii) 8 for blue. Combinations of these bits are used to represent other colours. A 24-bit image offers 16.7 million (2 to the power 24) colour values. File size – It is calculated by multiplying the surface area of a document (height x width) to be scanned by the bit depth and the square of dpi. Since image file size is represented in bytes, which are made up of 8 bits, this figure is divided by 8. If the pixel dimensions are given, they are multiplied by each other and the bit depth to determine the number of bits in an image file. Compression- it is the algorithms designed to reduce the size of the image for storage or transmission. Loss less schemes abbreviate the binary code without discarding any information, so that when the image is ‘decompressed, it is bit for bit identical to the original. They are most often used with bi-tonal scanning of textual material. Lossy schemes (e.g., JPEG) utilize a means for averaging or discarding the least significant information, based on an understanding of visual perception. They are typically used with tonal images. File formats – They consist of both the bits that comprise the image and header information on how to read and interpret the file. File formats vary in terms of resolution, bit-depth, colour capabilities, and support for compression and metadata. Optical character recognition (OCR) – It is a technology that enables the conversion of different types of documents, such as scanned paper documents, PDF files or images captured by a digital camera into editable and searchable data. Two matters are important for the organization which is adopting the digitization process. The first is to create and retain all the present and the future documents in the digital format and the second is to convert the old documents in digital format through the process of digitization. Digitization of old documents in the organization is handled through a digitization project which is normally handled by a separate team. The practical approach of a digitization project from inception to completion constitutes its life-cycle. The process is a step- by- step procedure that follows the process of digitization, archiving, access and management. There are several stages in the life cycle of digitization process. Digitization is the core activity of digital projects and consists of the process of converting information into digital form. The stages may vary depending on the nature of materials. 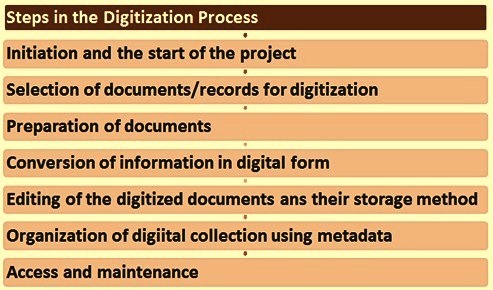 The general steps of the digitization process are as follows and also shown in Fig 1.